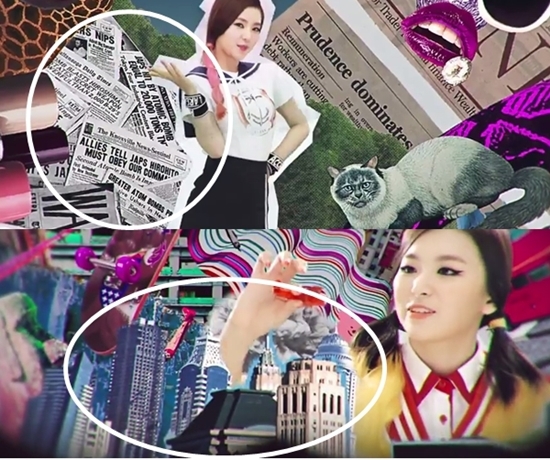 New K-pop girl group Red Velvet, composed of Irene, Seulgi, Joy and Wendy, is gaining buzz with the video for their single “Happiness” making headlines for allegedly containing disturbing images pertaining to the Sept. 11, 2001 World Trade Center attacks as with the 1945 bombing of Hiroshima. The music video, uploaded July 31 on YouTube, also supposedly contains ethnic slurs directed against the Japanese. The group’s management, SM Entertainment told Korean media that they are unaware of the said images. They promised to look into the matter, making clear that they are willing to remove sections of the video that prove offensive. Prior, an issue about the group’s name also erupted, with an indie band contesting its use. Apparently, the indie band have been using the name since last year. Not soon after, SM Entertainment announced having settled the issue. “Both parties decided to continue using their team names. SM′s new girl group Red Velvet will thus be able to continue promoting as scheduled,” said an SM Entertainment representative, as quoted on ENewsWorld.